Baruch Spinoza was 18 the year that Descartes died. He picked up on Descartes' philosophy. He wrote Descartes' Principles of Philosophy, published in 1663. Like Descartes he was a "rationalist," the school of philosophers inclined toward metaphysics and the supernatural – philosophers who tried to deduce their way to knowledge. Bertrand Russell in his History of Western Philosophy, wrote that Spinoza's "whole philosophy is dominated by the idea of God" and he describes Spinoza as "the noblest and most lovable of the great philosophers. Intellectually, some others have surpassed him, but ethically he is supreme." Spinoza has been described as a pantheist – God is nature – a view identified by many as atheism. But Spinoza denied that he was a pantheist. In a letter to Henry Oldenburg he wrote that "as to the view of certain people that I identify god with nature (taken as a kind of mass or corporeal matter), they are quite mistaken." The confusion is understandable given Spinoza's description of the god he believes in. Sino. He believed in God but not Satan or sin. By God I understand a being absolutely infinite, i.e., a substance consisting of an infinity of attributes, of which each one expresses an eternal and infinite essence. There is only one substance in the universe; it is God; and everything else that is, is in God. The second point above clearly has God and "everything else" as different entities. Spinoza believed that everything that happened was a manifestation of God's nature. This left out Satan and people causing calamity by having sinned. For Spinoza finding fault was a result of not seeing the whole. Russell wrote that this was Spinoza's intent to "liberate men from the tyranny of fear." Established religions did not like it. In the Jewish community where he lived, a council issued Spinoza a writ that was a kind of excommunication from the entire Jewish nation of Diaspora Jews – the nation of Israel. Spinoza was accused of "heresies." Also, it is said, there was fear that Spinoza's ideas would reflect badly on the Jewish community in the eyes of the Christian leaders of Amsterdam, endangering the limited freedoms that the Jews had achieved in that city. Spinoza was accused of atheism by Orthodox Jews and Orthodox Christians alike. He, in turn, advocated thinking for oneself free of ecclesiastical authority. People, he believed, had to work toward their own conclusions, not unlike Siddartha Gautama, the Buddha, who believed that people should be their own light. 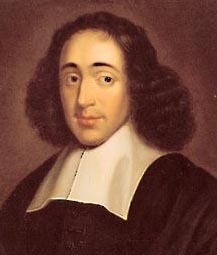 Spinoza believed strongly in the freedom to think for oneself, to work toward one's own conclusions, free of ecclesiastical authority. He spent his last twenty-one years writing and studying, living quietly and pursuing the profession of lens grinder. He who clearly and distinctly understands himself and his emotions, loves God, and so much the more as he understands himself and his emotions. The mind's highest good is the knowledge of God, and the mind's highest virtue is to know God. The first reaction to Ethics has been described as disgust. It would take a while and a historical drift in attitude for him to acquire a following. Spinoza's admirers can be seen on Amazon.com, where readers who appreciate metaphysics have expressed their opinion of his book Ethics. One describes the book as "a towering work by an absolute genius, a mathematical definitive explanation of G~d, the universe and man's place in it." Another writes that "Spinoza teaches us to be moral without religion, but with a total belief in God. His view is that there is nothing that cannot be known."